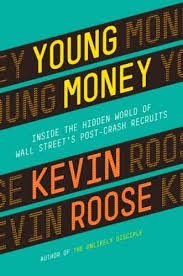 Young Money by Kevin Roose was an interesting and very fast read about junior investment bankers working on Wall Street. The book chronicled under assumed names the early in career lives of eight different people and, while the approach seemed to diminish the amount of narrative throughout, there were fascinating stories told of these workers at heavyweight financial firms like Goldman Sachs and J.P. Morgan. The jobs embarked on were difficult to get with the top Wall Street firms recruiting top-level students from elite colleges and most of the positions two-year programs that people work as analysts and those wanting to stay in banking either getting hired as an associate at that firm or take what's viewed as the ideal next step in investment banking with a job at a leading hedge fund or private equity firm. Roose details in the book how these positions are also pitched and viewed by many as a sort of way-station stop, with many people spending the two years in investment banking and then making a decision to either remain in the field or leave, with now more than ever there being opportunities to take the experience and move into technology start-ups. In terms of the two-year investment banking analyst roles, Roose notes how annual salaries out of college typically around $70K, with a bonus of anywhere from $20-70K on top of that. He also covers how as a junior analyst, you're on call for whatever associates or executives want you to do for oftentimes 100 hour work weeks with the deliverable typically large Excel spreadsheet (incredibly to me as it seems there would be a better tool to use) models about company valuations and what might happen if a particular mergers or acquisition were to occur through that particular investment bank. It's an interesting book and one thing I found noteworthy was the categorization of investment banking and finance as falling under the category of work not necessarily creating anything. Not that everyone in a position to get a fulfilling job where they create, but it's an interesting thing to think about. Related to this, I found compelling in the book mention of 2012 Yale graduate and writer Marina Keegan and an essay she wrote for the campus news magazine about working in investment banking, with her then adapting the essay into "The Science and Strategy of College Recruiting" for the New York Times website. Roose at the end of the epilogue dedicates his book to the memory of Keegan, who died in a car accident a week after graduating Yale and had her essay "The Opposite of Loneliness" for the Yale Daily News distributed at commencement.